When a video is uploaded to Video Cloud, poster and thumbnail images are created automatically by taking a snapshot from the source video at the midway point. The size of the poster and thumbnail is based upon the dimensions specified in the ingest profile used when uploading the video. Note: If you don't like the default images that were captured, you can upload a new image or capture a new image to use as the poster and thumbnail. Depending on the size of your published player, the poster image may be upscaled to fit the player. Scaling images may make them appear blurry and distorted. Having poster images that are a larger size will eliminate the need for upscaling images. Click on a video to open the video properties. In the IMAGES section, right-click on the poster or thumbnail image. Depending on your browser, there should be options to either save the image or copy the image address. By saving the image or using the image address to open it in another tab, you can see the size of the image. You may wish to use one of the many tools available that can give you the exact dimensions of the image. Remember, if any of your players are larger than the size of the poster, the image will be upscaled. In the Studio header, click the ADMIN link. Note that you must be a Video Cloud Studio user with the Administrator role to access the ADMIN menu. Click on a Profile Name. The Profile Editor will display the profile definition. The method to view the image sizes will vary based upon the Profile Version (i.e. Legacy, Dynamic Delivery or Context-Aware) that was clicked. For Legacy profiles, scroll to the bottom of the Profile Editor window and search for "media_type": "image". There should be two entries, one for the poster and one for the thumbnail. For Dynamic Delivery and Context-Aware profiles, image sizes are listed in the Images section of the profile definition. The following example is from a Dynamic Delivery Profile Version. Check the poster and image sizes. Remember, if any of your players are larger than the size of the poster, the image will be upscaled. 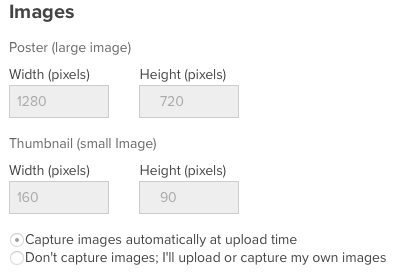 In order to change the image sizes, you should create a custom ingest profile and set the sizes to the appropriate values. For information on creating custom ingest profiles, see Managing Ingest Profiles. Note: Increasing image sizes will cause an increase in managed content and bandwidth usage but this should be negligible, unless the play rate on your videos is extremely low, in which case the images loaded for unplayed videos could consume more bandwidth than actual video playback. Once a new ingest profile (or profiles) has been created, that profile should be used when uploading videos. Note: The standard set of ingest profiles can't be edited or deleted. When you add custom poster and/or thumbnail images via Studio or the Dynamic Ingest API, by default Video Cloud will resize these to match the image sizes defined in the default Ingest Profile for the account. Note: This option is only available when using a Legacy profile version. Make this the default profile for the account. Now when you add custom images via Studio or Dynamic Ingest, they will have the original dimensions of the source images. What about my existing videos? Retranscoding an existing video will generate new poster and thumbnail images. The video should be retranscoded using an ingest profile that has larger image sizes. For information on retranscoding existing videos, see Retranscoding Videos using the Media Module. A new, properly sized poster image can be uploaded using the Media module. When a new poster image is uploaded, the image will be transcoded using the default ingest profile for the account. You should ensure that the default ingest profile has the video thumbnail image sized appropriately. To view the default ingest profile, when viewing the list of ingest profiles, look for the marked with the indicator.